The Police have finally announced details for their last-ever show, which will be held Aug. 7 at New York's Madison Square Garden. Proceeds from the concert will benefit New York public television stations Thirteen/WNET and WLIW21 (the band will also be making a $1 million contribution to Mayor Michael Bloomberg's MillionTreesNYC initiative to plant trees all over the city). Tickets to the Madison Square Garden show will only be available via donations to the station, starting June 14. That day, the stations will air a Police retrospective featuring new interviews with the band and vintage concert clips. Tickets will be sold to donors in pairs at four price levels: $150, $350, $500 and $750. Also available is a $5000 package featuring access to soundcheck, and a $2000 combo with prime seats and a private pre-show party. Members of the Police fan club will still get the first crack at tickets, beginning Monday, June 9. 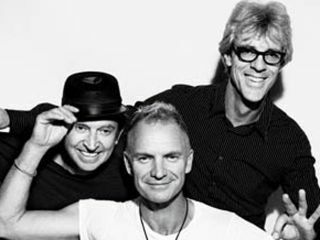 The Police's reunion tour began in May 2007 and was the top tour of the year at more than $212 million gross and nearly 2 million in attendance. Recent shows have seen the band debuts songs like Hole In My Life, Bring On The Night and Demolition Man, none of which were played last year.